Professor Arthur Kaser is the University Chair of Gastroenterology and Honorary Consultant at the University of Cambridge and Cambridge University Hospitals. He qualified from Leopold Franzens University Innsbruck and held earlier positions in Innsbruck and in Boston at Brigham and Women’s Hospital & Harvard Medical School. Arthur’s laboratory studies the mechanisms causing inflammatory bowel disease, and has made major contributions into our understanding of genetically-affected pathways at the host – environment interface. His research is supported by the Wellcome Trust and the European Research Council (ERC). In addition to fundamental research into disease mechanisms, Arthur also explores new treatment targets through experimental medicine- and early phase clinical trials. 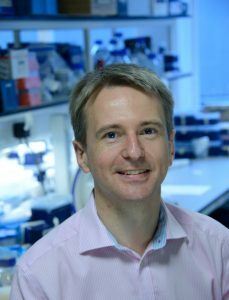 Arthur chairs the Cambridge Immunology Strategic Network, and is Course Co-Director of the Cambridge-MedImmune PhD Programme. He serves as Associate Editor of GUT, and chairs the Research Board of United European Gastroenterology (UEG).